Gudden, Johann Bernhard Aloys von, 1824-1886. München : Rudolph Oldenbourg, 1874. Description : [4 l.] p., -48 p., [11 l.] pl. ; illus: 149 phot. figs. ; 32 cm. 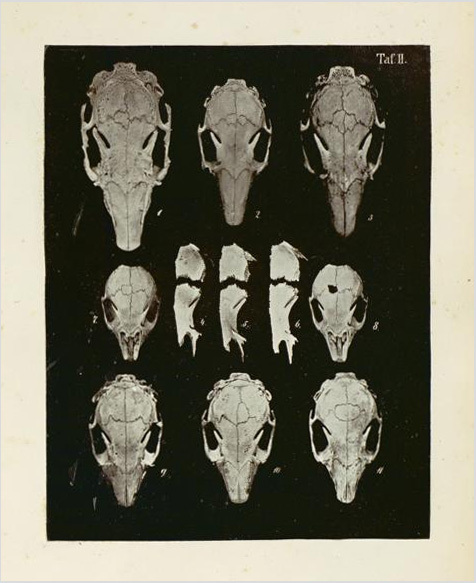 Photographs : 11 collotypes (Lichtdrucks) of experimental animal skulls. Subject: Cranium — Osteogenesis ; sutures. Author caption: von Dr. B. v. Gudden, K. Director der oberbayrischen Kreisirrenanstalt, o. ö. Professor der Psychiatrie an der Ludwig-Maximilians-Universität u. o. Mitglied des Obermedizinal-Ausschusses in München. Medical degree, University of Halle, 1848. Director, Unterfränkische Landes-Irrenanstalt, Werneck, 1855. Professor, psychiatry, University of Zürich, 1869. Director, Bavarian Kreis-Irrenanstalt, Münich, 1872. Professor, psychiatry, University of Münich. GM-1406: Gudden's commissure & Gudden's atrophy (1870). GM-1516: studies on the semi-decussation of the optic pathways (1874). French edition: Recherches Exprimentales Sur La Croissance Du Crane (1876). French edition translated by Auguste-Henri Forel (1848–1931). It wasn't until the 1950's that the ontogenesis of facial and cranial sutures was finally puzzled out by Pritchard, Scott and Girgis. Gudden, however, was the first researcher to use physical markers to study cranial development. By first trepanning three fine holes in the frontal or parietal bones of a newborn rabbit, and then mapping their positions after the animal had matured, Gudden was able to determine that bone growth was most active at the edges of the osseous plates. He also discovered that ligation of the carotid artery led to deformity in the bones of the skull, but with no synostosis appearing in the sutures. The reverse effect occurred when the jugular vein was ligated, producing synostosis of the sutures, absent of bone deformation.